Ever since I laid eyes on it, I’ve been drooling over this beautiful dress shrug in the Knit 2 Together book by Tracy Ullman. Because I can not machine knit the lace in the pattern on my Bond Ultimate Sweater Machine, I had to find something else to use. Google to the rescue. 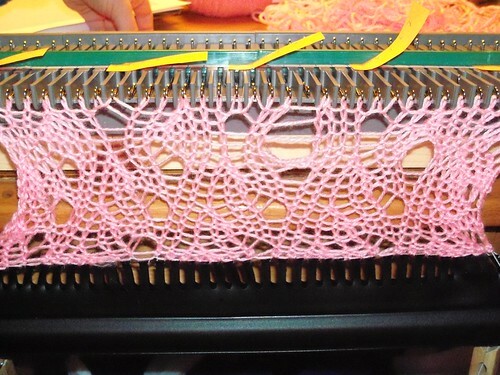 I’m currently working on learning Porcupine Quill Lace, as I thought it would be gorgeous attached to the shrug body. So I picked up some Red Heart Baby Soft, which is 22 sts per 4 inches, the right gauge for the pattern. It’s acrylic and cheap, so I figured it’s be great to learn on. I did three lefts and one right before I stopped. Here it is, still attached to the machine. In the top middle (below the third post-it note) is where I dropped a stitch and it unraveled. What you’re looking at is the purl side. The little post-it flags have the numbering on it so I don’t have to constantly stop and count to get the correct stitches transferred. And here it is, on the knit side, Belle holding it out. The sample is small, but it only took me about 15 minutes on the machine while I learn the pattern. I used a cast-on edge at the hem so it’s slightly rolled. The waste yarn is on the end that was attached to the machine. 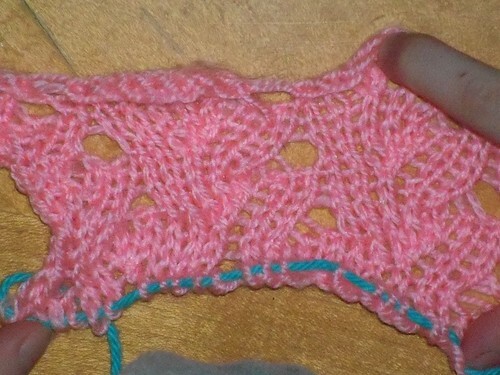 Now I will move on to doing a large swatch of the lace and practicing more. Once I am able to get a second Bond machine and attach them together, I can do a whole shawl with this lace alone in one piece instead of having to seam pieces together.